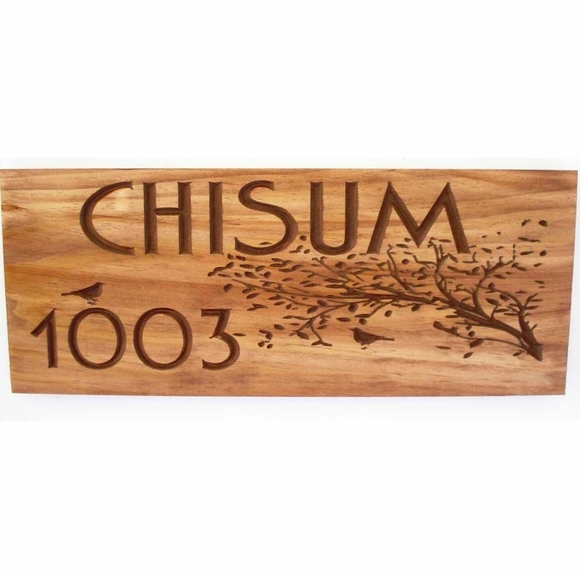 Bird and Branch Carved Wood Address Plaque - - personalized pine carved address sign. Wall mount. Nature theme with a subtle nod to Asian influence. Made in USA. Two line address sign customized with the name and house number you specify and the edge style you select. Solid pine construction. Rustic brown finish. Carved personalization and design. Modern rustic design features birds, graceful tree branches, and delicate leaves. Three sizes: 18"W x 7"H x 3/4" (shown in large image); 22"W x 9"H x 3/4"; 24"W x 11"H x 3/4". Name line holds up to twelve (12) 2.25" letters. House number line holds up to five (5) 2.25" numbers. Name line holds up to fifteen (15) 2.25" letters. Name line holds up to seventeen (17) 3" letters. Notice how the characters in the 6-letter name (large image) are chunkier and spaced farther apart compared to the characters in the 12-letter name on the same size sign shown in the first small image. Please make sure to order the correct sign size for your name. (NOTE: you do not have to fill the entire input box.) Leave the two other Name input boxes empty.